Leinster Rugby have announced that they will honour a very special Leinster supporter at the Guinness PRO12 game against Connacht this Saturday in the RDS Arena (Kick Off: 5.15pm) and have asked for the help of those in attendance at the game in doing same. Liam Hagan, from Threemilehouse in Monaghan, had been nominated by DEBRA Ireland, one of Leinster's two charity partners, to lead out the team as a mascot but tragically Liam passed away only a few short weeks ago. Liam, a lifelong Leinster fan, was born with a severe form of EB (epidermolysis bullosa) a genetic disease that causes skin, both inside and out, to blister at the slightest touch. 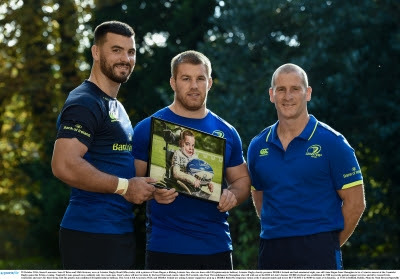 His place as mascot will now be taken by his best friend and cousin Adam McCormick, also from Monaghan, who will now lead out the team in Liam's honour and Leinster Rugby have asked all supporters to acknowledge Liam and his courageous fight at the game. DEBRA Ireland will be in attendance at the game and will be handing out butterfly tattoos and are asking supporters to wear the butterfly in a show of support for Liam and other families fighting EB. In addition Leinster announced that SKY Sports, the broadcasters of the game, will scan the crowd at half time to pick out supporters wearing their butterfly tattoos and one lucky supporter will win two Leinster Rugby season tickets for next season as well as other spot prizes on the night. "This is EB Awareness Week and Liam, being a rugby nut despite the pain he felt every time he touched a ball, was the obvious choice as mascot for Saturday's match. "EB is often described as 'butterfly skin' because the skin is as fragile as a butterfly's wing, and just as easily damaged. Saturday is still Liam's day and we are asking people all over the country to wear a butterfly temporary tattoo for him and all families fighting the battle with EB. Liam, whose big wish was to one day make a trip to Disneyland, lived with his mum Gráinne and his grandparents Paul and Kathleen and they will be guests of Leinster Rugby at the game on Saturday. Anyone wishing to support DEBRA Ireland during #EBAwarenessWeek is asked to text BUTTERFLY to 50300 to donate €4 and DEBRA Ireland will receive a minimum of €3.25 from every donation. Thanks in advance for any support that can be given to this great cause. Can Ireland win the Six Nations in 2017?